Glaze with the mildest of cutters. Step No. 3 in the Finesse-It 3000 process as indicated on the label (the process includes Step #1, 3M's 06085, Compound for most paints; step #2, 06064, Swirl Mark Remover; & 06068, Ultrafina SE [Swirl Eliminator] for dark colors or difficult swirl marks). Designed for dark paints or anytime difficult swirl marks are encountered. It does not just cover and hide them it actually takes them out. This material must be used correctly to perform correctly but the result is absolute perfection. This material will not remove compounding marks (those of 06985, Compound, step #1), that's step #2, 06064, Swirl Mark Remover's job, but when used to finish it will perfect the surface. Use enough of this material to leave an oily finish. A little splatter will accumulate on adjacent surfaces (easily wiped off) when enough is reached. Do not buff to dryness. 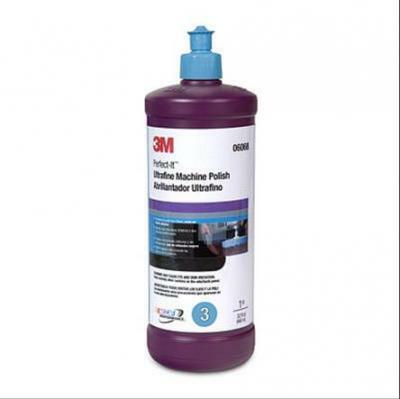 Use 3M's blue Ultrafina foam pad. 05751 or 05733. The pad and Swirl Eliminator are matched. Machine polish designed to eliminate swirl marks and produce a high gloss finish. Excellent for dark colored vehicles.